It’s been a tough gardening year for our family. We have had one of the hottest summers on record in Colorado with nearly 3 months of temperatures in the 90s and 100s. With great sadness we watched wildfires grow out of control and homes and even lives being taken. Luckily we don’t live in the mountains. But our lives were directly touched in so far that we had to watch our garden and backyard wilt away in the relentless summerheat. We never buy tomatoes at the grocery store. I just cannot abide the bland taste of a hothouse tomato. It doesn’t compare to a real tomato grown in your own garden. But this year has been a real challenge for us. Our tomato plants struggled all summer, despite our diligent watering and nuturing them. Only in the last week or so we have had enough tomatos to slice up for sandwiches or make a favorite fresh pasta dish. Strangely enough our other garden, our community garden patch, has done a lot better than our garden by the house. 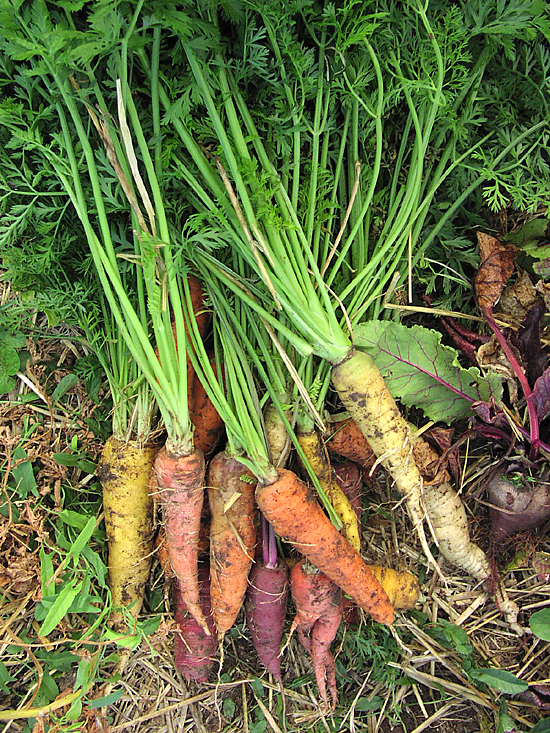 We have been harvesting vegetables every week. The carrots have never been bigger and better. We ate so many beets and beet greens that the children are sick of them. We have had peppers in many shapes and sizes. Enough to share with friends and neighbors. One small row of green bean plants has been providing beans for two families over the last 4 weeks. Our butternut squash and potatoes are almost ready to be harvested and stored away for the winter. But there is a great mystery when I look at the garden patches surrounding our two rented plots. I see tons of produce going unpicked and rotting on the vines. 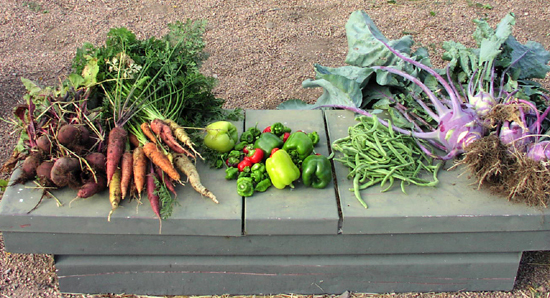 Why would somebody plant a garden, water and nurture it all summer, and then never pick the food? It just boggles the mind. I look at giant zucchinis that could feed a family of twelve, feeling sorely tempted to take one home to make a yummy zucchini chocolate cake. I found this situation so frustrating that I contacted the director of the garden plots last week. Isn’t there any way we could donate this food to the local foodbank, I asked her? It just doesn’t seem right that when so many families are struggling in these hard economic times that food should go to waste like that. The other day I read somewhere that 40% of food in the US is thrown out. I could not believe that number. It guess it seemed so incredible because our family is very conscious of what we prepare and using up all leftover food. Sure sometimes something goes bad. But when I look at the field of little garden plots I do believe the numbers. It fills me with great sadness to see pounds and pounds of tomatoes, peppers, beans, and many more vegetables rot. How do you feel about these issues of food waste? 40%…. wow! That’s just sad. I have seen the same thing with our neighbor’s garden from the place we just moved from. They planted and picked so eagerly for the first half of thesummer, but then I guess they just got burned out because I saw so many ripe tomatoes just fall off and rot. Sad…. That’s an unbelievable number! I was raised not to waste and am raising my children that way as well. When you see poverty around you, as we see here in Africa, you know you cannot waste, especially not food! I know. But the more I look around me I can believe it. Restaurant portions are always too big. Lots of food gets thrown out that way too. I thought we could pick the food at the gardens and donate it to the foodbank. But nobody responded to the emails and we can’t just go and steal the food, can we?